Recently Todoist introduced some new changes to their Karma system in their task management application. For those not familiar, Karma is a gamification system that Todoist incorporates in the app. The idea is that completion, or at least management, of todos and use of various functions of the app will increase a user's scores. Over time, as their scores increase, users can reach certain levels of achievement. 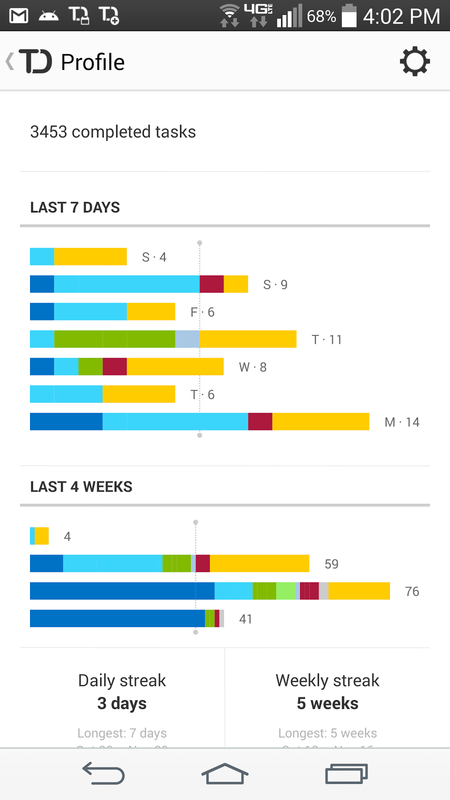 Mixed in with the Karma function, Todoist includes a variety of charts and data about tasks that have been completed. Part of the new features Todoist introduced is a method to track streaks where users reach daily and weekly goals for the completion of tasks. Although that feature is not the focus of this post, it is what triggered my latest changes in how I have Todoist configured. Shortly after the introduction of updated Karma, I was checking out how my streaks were going when I noticed something about the charts showing the number of completed tasks as a horizontal bar chart. If you look at the screenshot I captured when I had this epiphany, you'll notice that my bars are dominated by a single color, blue. 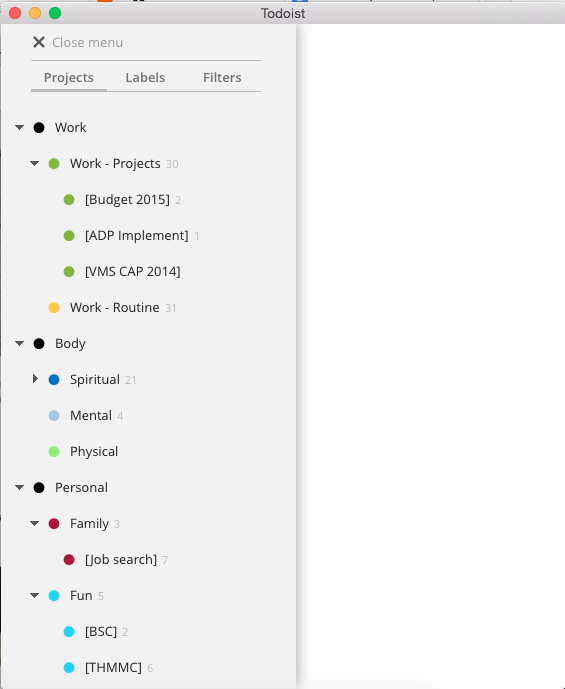 For those not familiar, the different colors in the chart correspond to the Project labels that you can setup in Todoist. The color, blue in this case, corresponds to the Standalone category that I had setup the last time I worked on my Todoist configuration. When I last modified my configuration, I based my projects on What's Best Next. Even then I noted that there was some redundancy with the Labels I was using. My labels roughly correspond with GTD's concept of contexts with an update in light of the changes in technology. As it turns out - based on my review of the completed tasks chart - everything was getting dumped into the Standalone category and that was also where I was doing virtually all of my work. The problem with everything ending up in one category like that is that the categories end up being meaningless. Now, it is entirely possible to continue with the way I had things setup with most tasks coming through Standalone and every now and then some stuff coming through from other projects. The setup doesn't necessarily have a negative impact as my use of labels for contexts has been effective and tasks are trickling up through the system to my attention when they should. Still, it seemed like a waste to have this Project function available in Todoist yet being underutilized. That got me to thinking about how I could change this. I decided to incorporate some concepts from the Balanced Scorecard, which turned out to be some interesting timing as we just recently abandoned a Balanced Scorecard framework for strategy and goals on my job. For my personal use though, I wanted to add in the concept of perspectives. The idea I have in my head is that selecting appropriate projects or perspectives, I could get a better balance of tasks being completed. This would be reflected in the charts with several colors showing up. Developing new Projects based on perspectives took some reflection over a few days to distill what would work for me. I also had to figure out how to incorporate actual projects into the framework. I came up with the Projects shown in this new screenshot. I ultimately decided any projects that were large enough to warrant their own "folder" would be placed under the top level where they belonged and would get the same color as the level above. As you may note, I created three projects to serve as the top level projects. These are really just for organization purposes and no tasks will go into them. They included Work, Personal and Body. For the Work area, I divided my tasks into those that are routine and those that are projects (or non-routine) for anything related to work I do to earn a living. Both of those areas get their own color. In addition, underneath the Work - Projects entry there are a few individual projects. Meanwhile, for Routine stuff there are no sub-levels just because I felt like I didn't want any projects in there, but some users could do that if they wanted to. The next area is Body, which is where I decided to group anything that had to do with my physical body, my mental development, or spiritual growth. In the spiritual area I include things like Bible reading or some of the tasks related to my church service. For the mental area, anything that helps keep my head clear goes in there. That includes GTD related stuff like my weekly review. Finally, the physical area will be for anything related to my physical health (which sadly, you will notice is currently empty). The last area are Personal projects. Similar to Work, I divided these into two areas - anything related to my family and anything I do just for my own enjoyment (or Fun!). Similar to the work area, if needed I will create individual projects at an even lower layer if I think it is warranted. The goal as I mentioned is to get bars in the Karma overview that are a rainbow of colors indicating I am not concentrating on any one area too much. Some may object that this is forcing work or the completion of tasks just for the sake of achieving a certain result. However, that is supposed to be the purpose of the balanced scorecard - by consciously deciding to pursue goals/tasks in each of the different perspectives, you end up being more balanced which makes the whole stronger than the individual parts. To achieve a goal of better balance, it does mean I will have to keep an eye on the Karma charts. I already kept an eye on my Karma score, but making a goal related to the Karma results means I will have to keep an eye on it even more. My initial impression after using this for a few weeks is that it is helping me address areas where I was being lax. I can also see where it could be very useful in helping me establish new habits. For instance, adding in some (new) focus on my physical health may involve setting up a new recurring tasks in that Project and as I complete those tasks, I should start to see that light green showing up in the daily charts. I'll review things again in six months to see how it is working out, but it seems to hold some promise. Thanks for the tips .. real interesting. We have a moon landing!